The power of centered focus. When you start a project, it’s often hard to know where you need to focus. There are often multiple sections/objects that you need to take into consideration. I often question what item I should start with? This often requires that I set priorities for each item. Selection by priority is hard to do. I ask myself; what is important and what isn’t? Often I just start with one thing and take action. Over time, I’ve found that it’s better to take action on one item than spending extended time trying to reach a conclusion. However, if I have a center focus, I can quickly make a decision. I just simply run my idea through the lens of the center item. I find the easiest way to explain this is a visual illustration. For a five category project, the X pattern is very helpful. 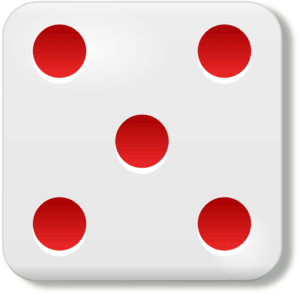 This is best illustrated by the number five on a pair of dice. The X pattern allows us to set a bullseye category in the middle, with four other categories surrounding it. I call this a Matrix Five Pattern.